Which Sandals Resort is the best? We get asked this all the time and the answer can vary considerably depending on each couple. Each Sandals Resort is popular for different reasons and no two couples are exactly alike. Sometimes it takes just one special amenity that makes it the best resort for the couple. To determine the answer, we start with some basic questions to narrow the selection and then key in on the specific differences between the remaining resorts. Is there a specific island destination you desire or want to avoid? Sandals Resorts are located in 6 basic destinations - Antigua, Bahamas, Jamaica, St Lucia, Barbados, and Grenada. Bahamas has 2 destinations - active Nassau and secluded Exumas. Each destination is very different based on scenery, economic conditions, and points of interests. In addition, a couple may already have traveled to a particular destination and would like to try something new. Perhaps there is a destination they would like to avoid based on past experience. This is a basic question that often narrows the choice although many couples are open to all destinations. We often tell clients (especially honeymooners) if they have the budget and time, St Lucia is our absolute favorite destination as we love the island scenery, romantic atmosphere, and all 3 resorts for different reasons. Which do you enjoy more: Pool, Beach, or Both? Some Sandals have great pools, some have great beaches, some have both. For some couples this question is not significant as they have other motivations for travel beyond the pools and beaches. For couples who lay on the beach all day or enjoy watersports, we would send to a resort with a great beach such as one of the St Lucia resorts, Antigua, Sandals Whitehouse, Sandals Emerald Bay, Sandals Negril, or perhaps Sandals Montego Bay. For pool couples, we would again recommend a St Lucia Resort or Antigua. In Jamaica we would keep Sandals Whitehouse which has the largest freshwater pool in Jamaica and also consider Sandals Grande Riviera. In the Bahamas, both Sandals Royal Bahamian and Sandals Emerald Bay have very good pools. For couples who want both great pools and beach, we would consider Sandals Whitehouse, Sandals Grande Antigua, Sandals Emerald Bay, the St Lucia resorts, and possibly Sandals Royal Bahamian with the offshore island. Is there a particular kind of room or suite that you would like? Where are you flying from and how far are you willing to fly? Sandals Royal Bahamian in Nassau Bahamas is the most convenient location as there are many nonstops from different cities available. For most, Nassau Bahamas is also the closest destination and shortest flight time, very convenient for short getaways. While also in the Bahamas, Sandals Emerald Bay much more difficult to get to as it requires either connecting through the AA flight from Miami or a connector through Nassau Bahamas. In general, Nassau and Jamaica have better flight availability and lower airfare costs. Antigua and St Lucia have fewer flights, further distance, and more expensive airfare. How far are you willing to travel from the airport to the resort? Sandals Grande Antigua and Sandals Royal Bahamian are very close at only 15 minutes away from the airport. In Jamaica, Sandals Montego Bay is only 5 minutes away while Sandals Royal Caribbean and Sandals Inn are both within 10 minutes. The other resorts in Jamaica and all 3 resorts in St Lucia require considerable driving time up to 2 hours each way. This factor often can make a difference as some people do not want to travel 2 hours while other couples enjoy seeing the countryside. Although 2 hours in length, the St Lucia transfers are very scenic as you go through the mountains and rain forest. In addition, we find the Jamaica transfers interesting traveling through the mountains and various villages. Seek seclusion or active environment? Some couples want to get away from it all and like secluded resorts or laid back low keyed atmospheres. A couple seeking seclusion would enjoy Sandals Emerald Bay which offers a very quiet atmosphere. Sandals Whitehouse has no other resorts or restaurants in the area and also has a large beach with secluded areas. Among the 3 St Lucia resorts, Sandals Halcyon is the most quiet and intimate, Sandals La Toc generally considered the most active. Other couples like a more active atmosphere such as Sandals Montego Bay where they say "the fun never stops". Sandals Negril more of a laid back Jamaican casual atmosphere but very social. Sandals Grande Riviera Great House section and pool area very active. Each Sandals Resort has its own unique character which can only fully understood by visiting - we try to convey these features to our clients. Golfers narrow the resort selection to about half the resorts. Sandals Grande Riviera Jamaica has an excellent 18-hole course with all green fees included. Sandals Emerald Bay features an outstanding Greg Norman 18-hole championship course set along the ocean and just steps from your room. Sandals La Toc in St Lucia offers a scenic complimentary 9-hole course (also available to guests from Sandals Grande St Lucia and Sandals Halcyon). Maybe you enjoy active lifestyle and seek a resort with lots of excursions in the area. Possibly you enjoy lush topical garden settings. Maybe you would enjoy dining and dancing under the stars overlooking the ocean. Possibly you are a watersports and scuba enthusiast and desire a resort with the most options. Maybe you want a villa at cliffside to enjoy the sunsets while overlooking the ocean. Possibly you want a room on the ground floor with direct entry to poolside. What makes a resort great is very subjective. One person can have a particular or multiple favorite resorts - all for different reasons. The appropriate choice should depend on the needs and parameters of the particular vacation that you are planning. What is the goal of your vacation? Is it rest and relaxation? Is it to have fun? Is it to enjoy a romantic experience with your loved one? Often it involves multiple goals and interests. Answering these basic questions will go a long way in finding the best Sandals Resort for your getaway. Sandals Grande Antigua offers modern luxury suites overlooking the ocean as well as many other accommodation options. 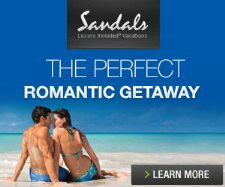 Sandals Royal Bahamian offers the convenience of an easy to get to romantic getaway. Sandals Grande St Lucia is a favorite of many for its luxury accommodations and romantic scenic atmosphere. A couple enjoying their cliffside villa and private pool at Sandals La Toc St Lucia. A group of couples enjoying Kimonos Restaurant while overlooking the sea. Enjoying dining under the stars at Sandals Montego Bay. Sandals Negril swim-up room with butler service. Couples enjoying the evening on the beach at Sandals Grande Riviera. An active couple enjoying fun time catamaran sailing..